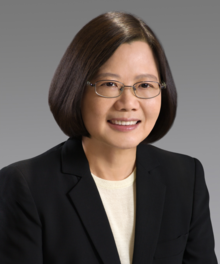 Tsai Ing-wen (born 31 August 1956) is a Taiwanese politician, legal scholar, attorney, and the current President of the Republic of China, commonly known as President of Taiwan, since May 20, 2016. The first woman to be elected to the office, Tsai is the seventh president of the Republic of China under the 1947 Constitution and the second president from the Democratic Progressive Party (DPP). She is also the first president to be of both Hakka and aboriginal descent (a quarter Paiwan from her grandmother), the first unmarried president, the first to have never held an elected executive post before presidency and the first to be popularly elected without having previously served as the Mayor of Taipei (the capital city of Taiwan). She is the incumbent Chair of the Democratic Progressive Party (DPP) and was the party's presidential candidate in the 2012 and 2016 presidential elections. Tsai previously served as party chair from 2008 to 2012. Tsai was born in Zhongshan District, Taipei, Taiwan on 31 August 1956, the youngest of 11 children of her father. Her father, Tsai Chieh-sheng (1918–2006), was a businessman who ran an auto repair shop, her mother Chang Chin-fong (1925–2018) was a housewife. [ត្រូវការអំណះអំណាង] Her given name, Ing-wen (英文), could be translated as "heroic literature" or "English language". During her middle school period, she studied in Taipei Municipal Zhongshan Girls High School. She studied law at the behest of her father. After graduating at the College of Law, National Taiwan University, in 1978, Tsai obtained a Master of Laws at Cornell University Law School in 1980 and then a Ph.D. in law at the London School of Economics in 1984. Upon her return to Taiwan, she taught law at the School of Law of Soochow University and National Chengchi University, both in Taipei. She was also appointed to the Fair Trade Commission and the Copyright Commission. She served as consultant for the Mainland Affairs Council and the National Security Council. She also led the drafting team on the Statute Governing Relations with Hong Kong and Macau (港澳關係條例). After her election, Tsai was named "The 100 Most Influential People" in TIME magazine 2 May 2016 issue. Yang, Wan-Ying; Lee, Kuan-Chen (July 2016)។ "Ready for a Female President in Taiwan? "។ Journal of Women, Politics & Policy (Taylor and Francis) 37 (4): 464–489។ អ.វ.ល. :10.1080/1554477X.2016.1192433។ https://dx.doi.org/10.1080/1554477X.2016.1192433. ↑ Ministry of Foreign Affairs brochures MOFA-EN-FO-105-011-I-1 (also appearing in Taiwan Review, May/June 2016) and −004-I-1.